The KITAGAWA Air Sampling Pump was completely redesigned in 2000. A large number of improvements were made with the user in mind. 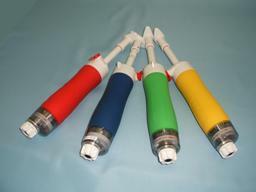 Now offered in four different colours (blue, red, green and yellow) in grip. Ergonomically designed. Soft contoured grip prevents slipping. Easy to pull handle. Antibacterial material. Sample Finish Indicator pops up when sampling is completed. The skeleton cover makes it easy to see. on the tip cutter prevents the scattering of glass shards until it is convenient to discard them. No power source is required making it truly portable for all applications. Rugged construction for even the harshest of environments.